Sqn.Ldr Brian Lane DFC, at the age of 23, was the commander of 19 Squadron, Fowlmere, during the latter stages of the Battle of Britain. He was an Ace, with 5 aircraft destroyed, 1 shared destroyed, 3 probable destroyed and 1 damaged. 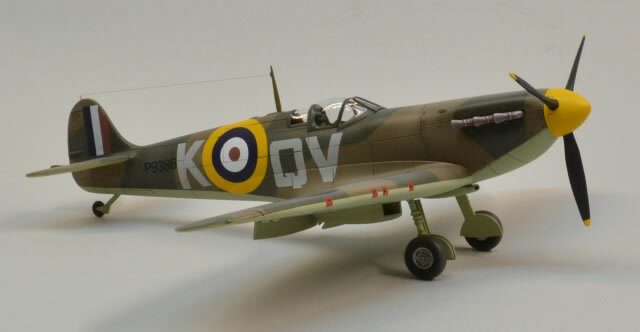 In September 1942 he commanded 167 Squadron, a Dutch Squadron, and during a mission on the 13 December 1942 he was last seen chasing an FW-190 over the North Sea. He never returned from this mission and was reported as missing in action. On Sunday 25 September 2011, a Memorial Plaque to Brian Lane was unveiled in a ceremony at his former home in Pinner, London, UK. 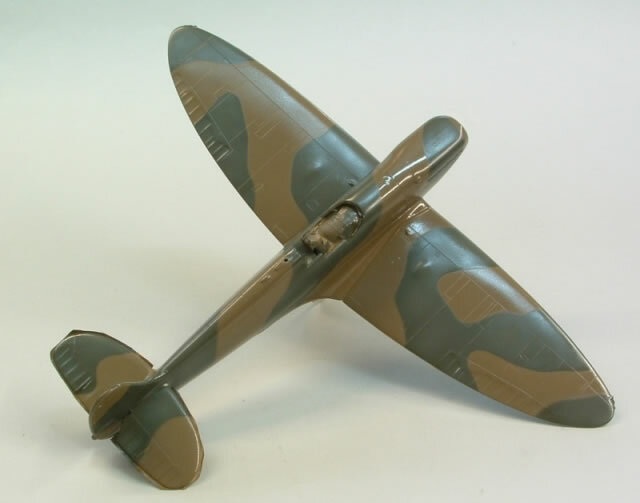 I have had the SuperScale decals for Brian Lane’s Spitfire for some time and decided to make a model of his aircraft using the Airfix 1/48 Spitfire Mk.I which fits in with our club ‘Airfix Group Build’ as featured on HyperScale. 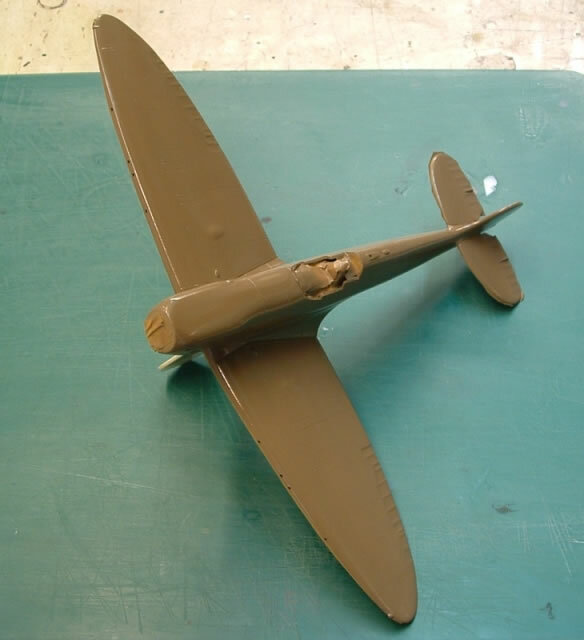 The fit of the Airfix 1/48 scale Spitfire Mk.I was fairly good, with just some filler required here and there. The trailing edges are a bit on the thick side but can be sanded down a touch. The cockpit interior was sprayed with Xtracolor X10 and then detailed painted where required. The instruments were dry brushed with Humbrol 56. The entire cockpit was then washed with thinned Tamiya smoke. 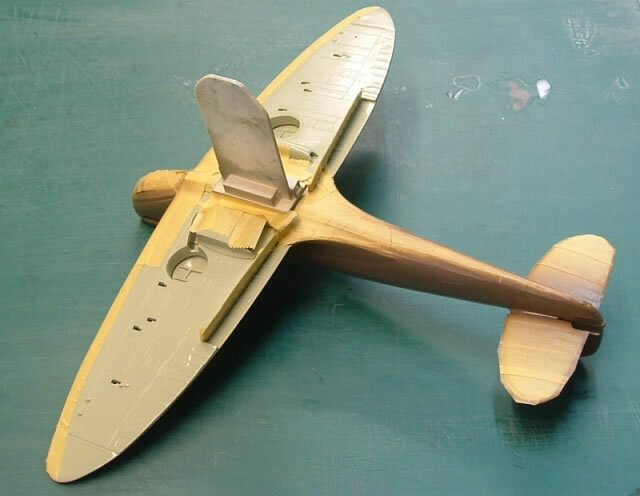 The assembled fuselage required a little ‘spreading’ to fit the wing assembly. 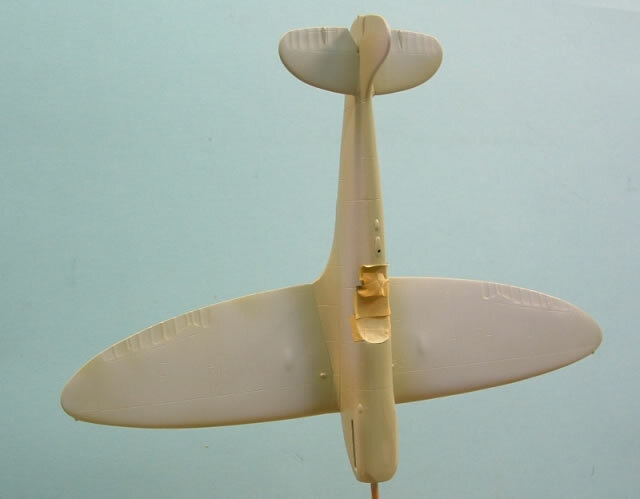 Some re-drilling of the fasteners was required on the top section of the wings. The panel line engraving was okay. 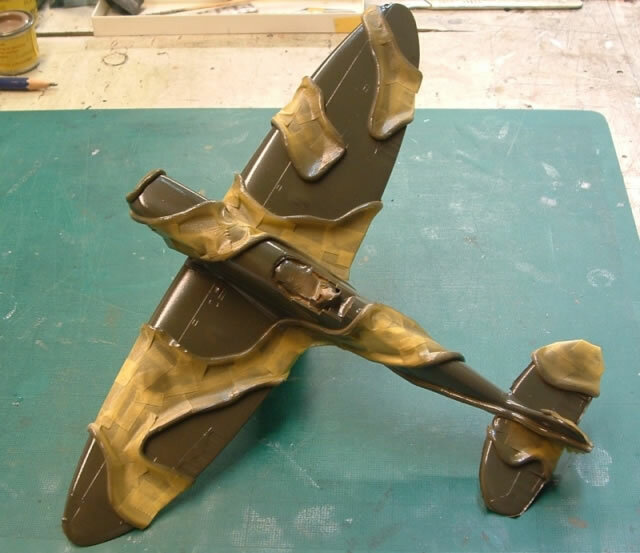 The moulded cockpit door ‘hinge’ was cut off and a more representative hinge added from a fine piece of stretched sprue. 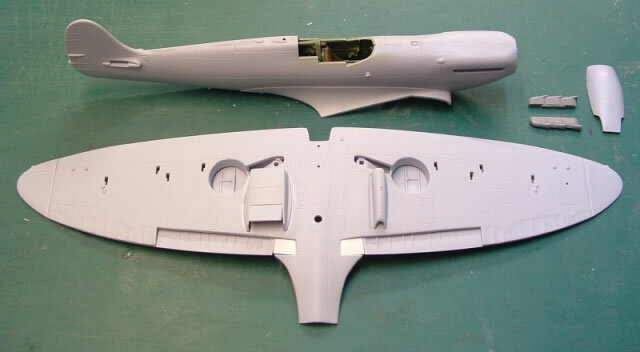 The ‘lump’ behind the pilots seat bulkhead was also cut off and a finer section of plasticard added. Small pieces of thin plasticard were added to the existing inner flap blanking piece to reduce the gaps. The radiator and oil cooler bases require some sanding and gap filling to achieve a flush fit into the wing. 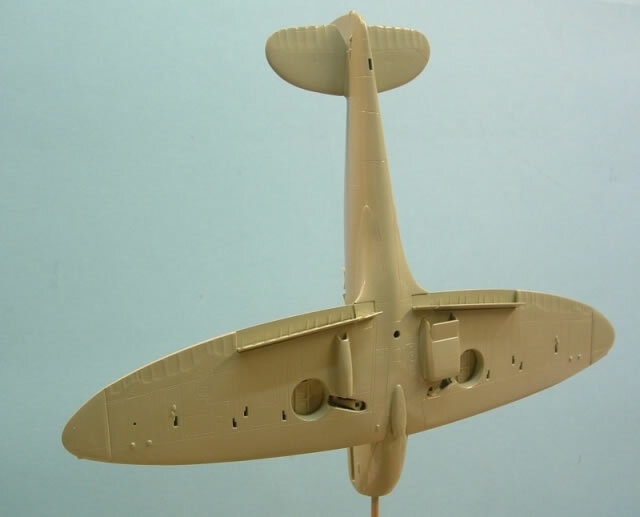 Also shown are Tamiya Spitfire exhausts which I used instead of the kit parts. I used Xtracolor enamels for painting my model. 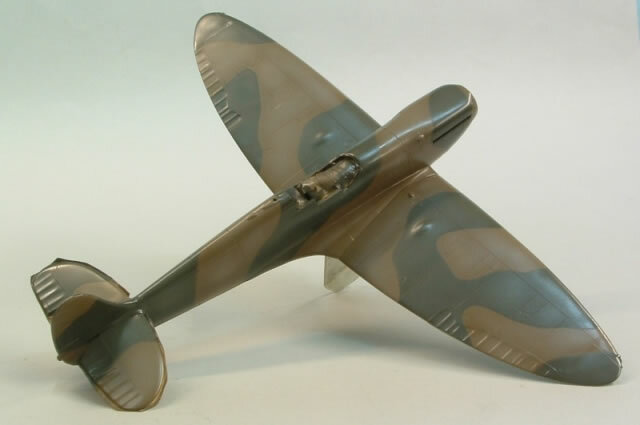 This aircraft had the ‘A’ camouflage scheme. 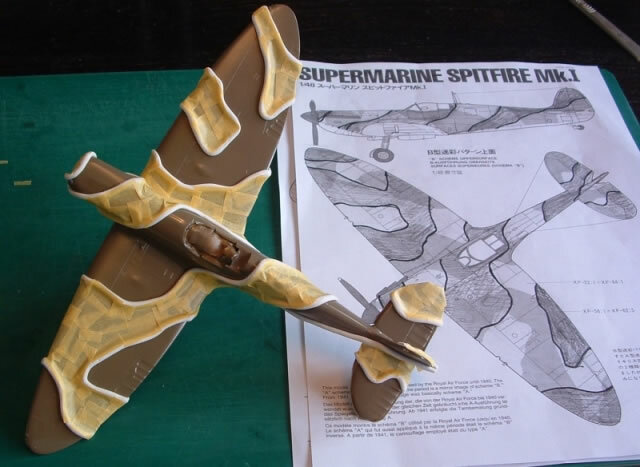 The Airfix instructions show the ‘B’ camouflage scheme, so I used a copy of a 1/48 Tamiya Spitfire Mk.I camouflage guide to produce the mirror image ‘A’ scheme. 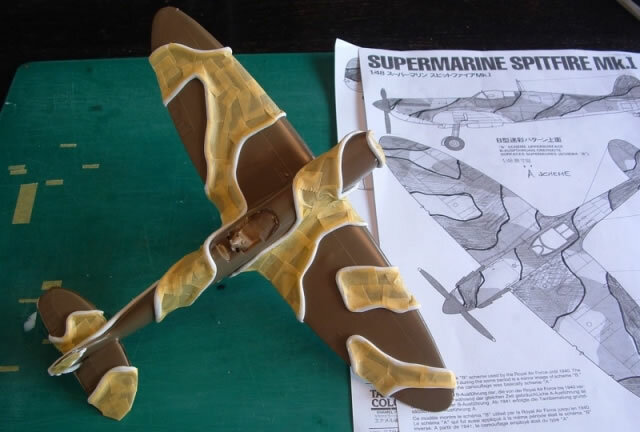 The Blu-Tack ’string’ and masking tape technique gives a nice soft edge to the dark green which is next to be sprayed. 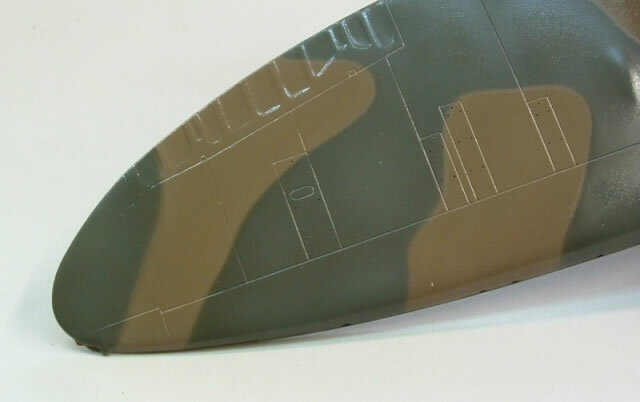 A lighter shade was applied in a few areas to the Dark Green, before the masking was removed. 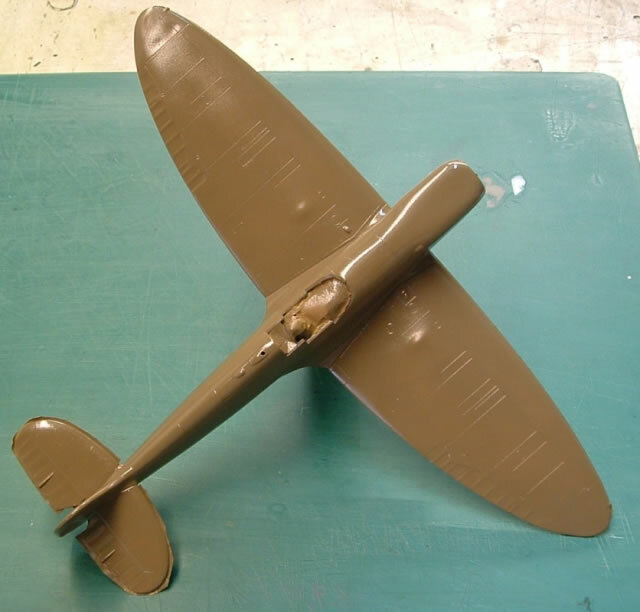 A lighter shade was also applied to the Dark Earth. 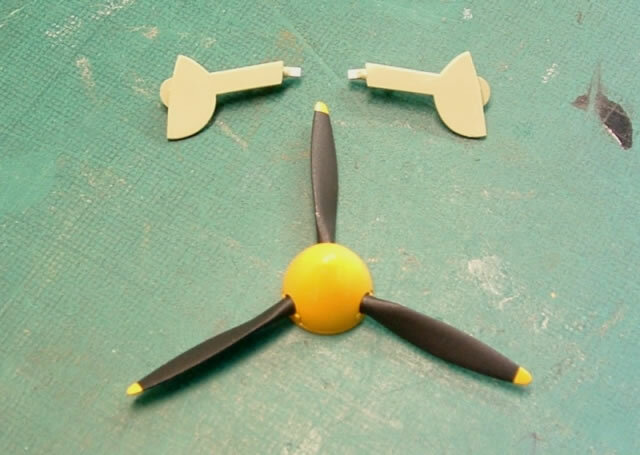 The main undercarriage assemblies were sprayed Sky and the finished prop and spinner. 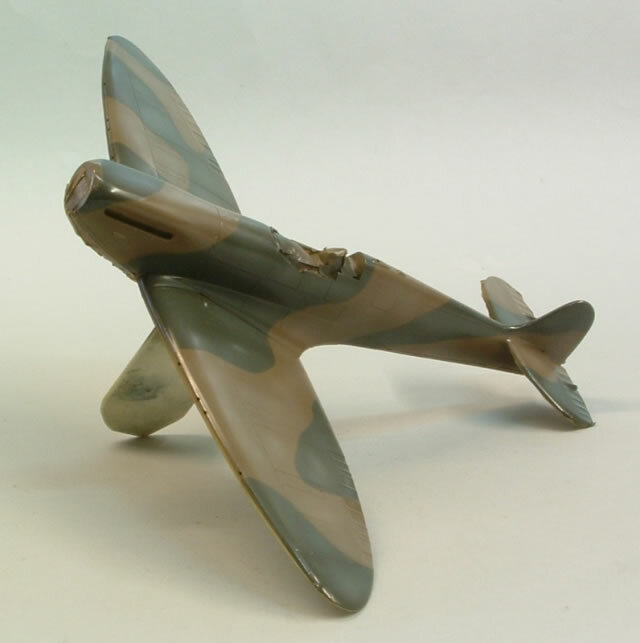 Brian Lane’s Spitfire had a yellow spinner, left over from the aircraft’s OTU service. 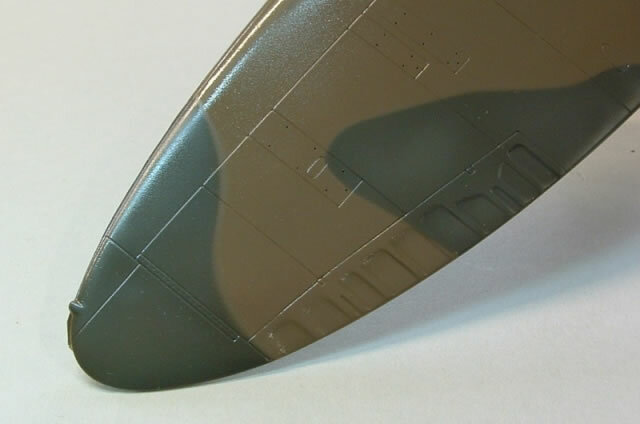 Panel lines were inked in with a dark brown acrylic ink. 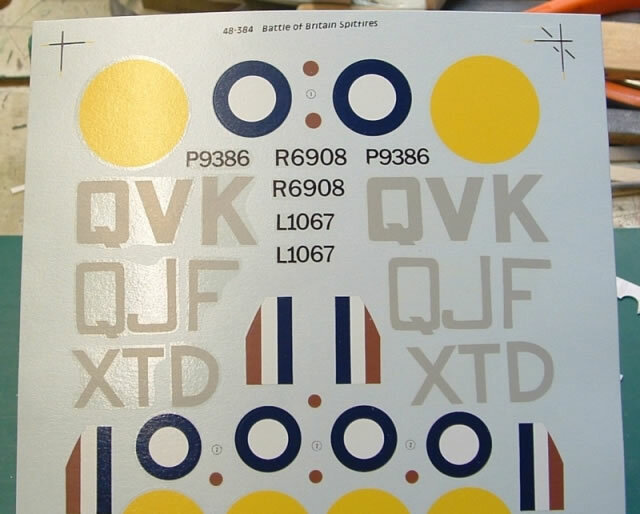 I used the small Airfix decals supplied for the gun port patches instead of masking and painting. The exhausts were sprayed Humbrol 133 and then lightly dry brushed up with Humbrol 56. This gives a burnt finish to the exhausts. 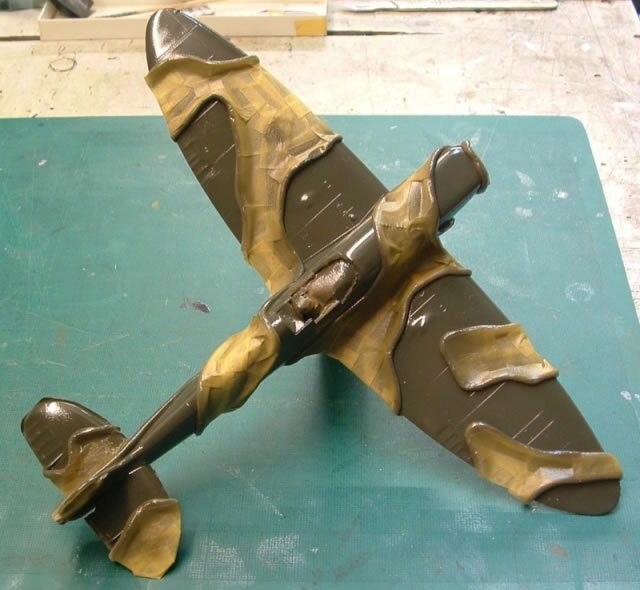 The undercarriage was added to the airframe and the entire model sprayed with Humbrol Matt Cote. The three pieces that make up the canopy were masked and sprayed dark green followed by a spray with matt cote. 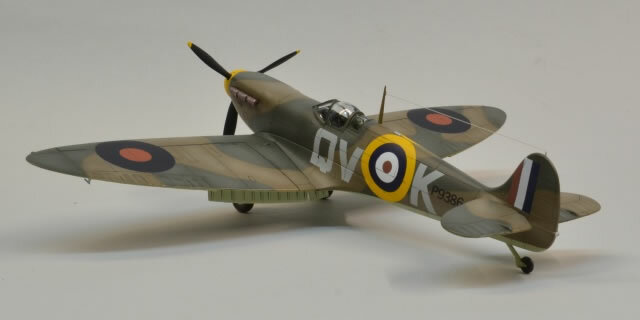 They were then added to the model. An aerial wire was made from stretched sprue. This model is my tribute to this brave young fighter pilot.